The ancient passage linking Christchurch and St Saviour’s Priory | Come Here To Me! « Sixteen Dead Men, but some more familiar than others. My last article looked at the morbid tale of the soldier who got lost in the crypts of Christchurch and was eaten alive by rats. This story is often told in connection with the alleged tunnel that ran from Christchurch to the area where the Four Courts is today. 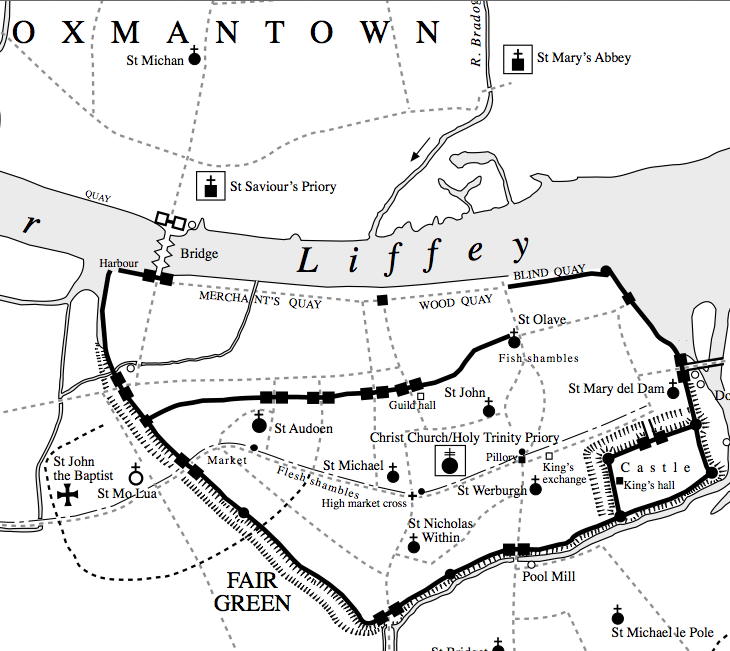 In 1224 the Dominicans (the Black Friars) established St Saviour’s Priory by the present location of Inns Quay on the Northside of the Liffey. They took over possession a small chapel which had been built four years previously. The priory’s extensive grounds reached to the corner of Cuckoo Lane and George’s Hill. They built a bigger, more suitable church in 1238 but this fell victim in 1304 to one of Dublin’s periodic fires. The priory buildings were taken over in 1539 under Henry VIII for use at first as courts of law, and then as a hostel for lawyers under the title of “King’s Inns”. The lawyers retained a chapel within the former priory for their private use. In later years, apart from its brief restoration to the friars in the time of James II, the priory was used in turn as a barracks, a theatre, a publishing centre. In 1786 the present Four Courts building was erected on the site. It was in Mr Bailie’s Timber Yard, corner of George’s Hill and Cuckoo-Lane, in a vault, approached by a great flight of stairs, also leading to a vaulted chamber which appears to have been an ancient church. The local tradition leads to the conclusion that these vaults extend to a great distance, south to the Liffey, and westwards to Thief’s Hole, near the Park Gate, which was opened about thirty years ago, when it was examined by the police, in consequence of a report that the body of a murdered female had been hid therin. Another source (The Annals of Dublin, 1987) suggests that it was in 1890 that workmen found the 150 feet long tunnel heading for the Liffey. This was alleged to have been the ancient passage which ran under the river to connect with the crypt of Christ Church. 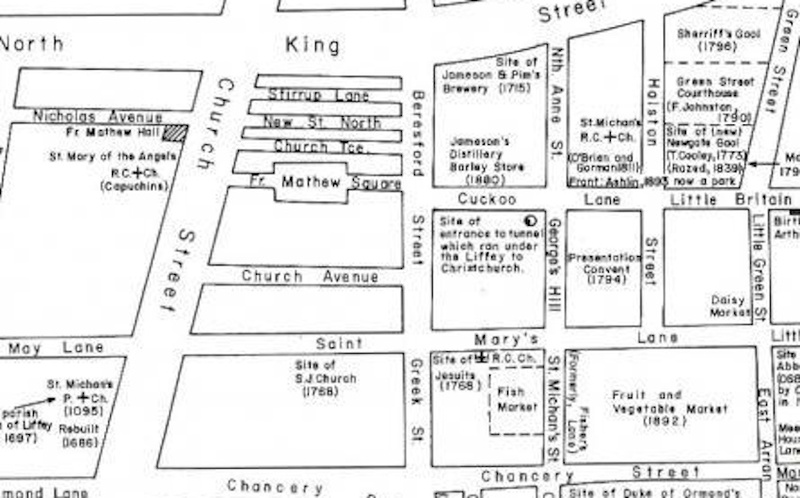 The building of the Four Courts … has removed all traces of the Dominican Priory … save (those) still under ground, several of which are known to exist in the locality starting from North King Street towards the river. One of the most interesting was up to some years ago in a good state of preservation, after a lapse of 700 years. It consisted of a series of lofty semi-circular and round arches, built on massive piers, which are approached by a descent of large steps built in what was, up to a short time ago, known as Bailey’s timber yard, George’s Hill. Opposite to the steps and in the first vault is a deeply arched recess in which there is a well of the purest water, said to be dedicated to St. Anne, from whom the adjoining street derives its name. On the left of the entrance vault is a built-up opening, which closes a vaulted passage, and tradition tells us that this passage extended to Christ Church, being tunneled under the river, and used at a remote period by the monks for the purpose of attending the ceremonials of the Cathedral. It is said that fifty years ago a workman procured a large ball of twine and some candles, and proceeded to explore the passage. He tied the end of the twine at the entrance, unwinding it as he went along, until he reached, as he considered, as far as Ormond Quay, when he was obliged to return, being driven back by foul air. The entrance was closed up in consequence of this exploit. So, while the dates are varying, there are three sources pointing to a tunnel being found at the corner of Cuckoo Lane and George’s Hill sometime between 1830 and 1890. …there is some traditional record of their leading by a tunnel passage under the Liffey, to the vaults of Christ Church, a tradition which I believe was the subject of some inquiry about two years ago on the part of Earl de Grey. However, there is certainly a bit more evidence to suggest there certainly was a tunnel found in the grounds of St Saviour’s Priory (Four Cours area). Whether it ran all the way up to Christ Church is another matter. This is not the only tunnel leading to Christchurch. The Templars built one from their site at the Bank of Ireland and they also connected one to Trinity College. Evidence of this is in the records of 1916, when British troops used it to reinforce Trinity College. It has also been confirmed to me recently that tunnels still connect Trinity to the Freemasons Hall on Molesworth Street and then to the Dail. There is still a lot we do not know about the real history of Dublin. Thanks for this informations.I looked for them,thanks again. But why are Dominicans called”the black friars”? I hope you will keep your promise to write more about all the tunnels in this area and of course more of Dublin history in this sense. As a student with the ‘blackfriars’ of the current St Saviour’s (on Dominick St), I find this completely awesome. Our own tunnel just to attend cathedral services?! Pretty cool… Some of you might be interested to know that the Dominicans in Ireland are one of the few Orders gaining vocations at the moment: there are 20 young men in formation right now, many of them in the studentate in St Saviour’s (www.dominicans.ie). Here’s a little insight into the current St Saviour’s Priory: http://www.youtube.com/watch?v=ytei-0tMjC0. I wonder could Scaldbrother’s story have a connection to these tunnels. Another connection is to my Father’s family, the Farrell’s (also related to Byrne’s, McGrane’s and Binns’ in the area); who at the turn of the 20th century lived on North Anne street. In the photo of Cuckoo lane above, their house would have been within the walls on the left hand side; it is listed in the 1901 census, but is now demolished. The large building to the left of the photo which houses a fruit and veg merchant, has its’ original entrance on Cuckoo Lane and was probably a Hughenot meeting house, or grand house originally. In fact if you turn off Cuckoo Lane and onto Halston Street, you can clearly see the entrance to the stables that would have been found to the rear of the house. This building was used as a schoolhouse until recent times. St. Michan’s RC church was built within the grounds of this grand house. I remember my father telling me that there was an entrance to St Marys Abbey in his grandparents yard. He remembered it being opened when he was a boy. he was born in 1927. They had some sort of stables near Halston Street. His mum was a Mary Anne Farrell. My Great grandparents house in No. 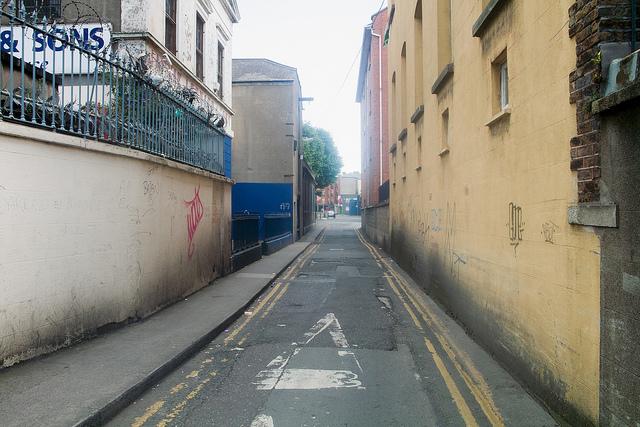 2 North Anne Street would have backed on to Halston Street! My great-grandmother is a Mary Farrell (nee Byrne) and she had daughter called Mary Oliver Farrell in about 1892 or so. My Grandad Terence Farrell also had other siblings called Kathleen, Eileen, Leo, & Joseph. Do you think there’s a family connection? I was intrigued by this possible linking tunnel, because I’m researching George Duke of Clarence – brother of Edward IV and Richard III – born at Dublin Castle in 1449 – and there are stories that he was baptised EITHER at the Dominican Priory – OR at Christ Church Cathedral. I’d like to clarify where the baptism took place – but I can’t find any clear evidence for WHICH church was used – though it is recorded that the Earls of Desmond and of Ormonde were his godfathers and both were present at the font. Jim my grandfather did have a brother Paddy but he lived in Dublin, and I believe Kathleen lived all her life in Dublin too. Yet some of your details overlap my ancestors so much I am wondering what the overlap is….? Hi Come Here to Me! could you take down my last post with my personal email in it? Jim has made contact with me, and I don’t want it staying up online.